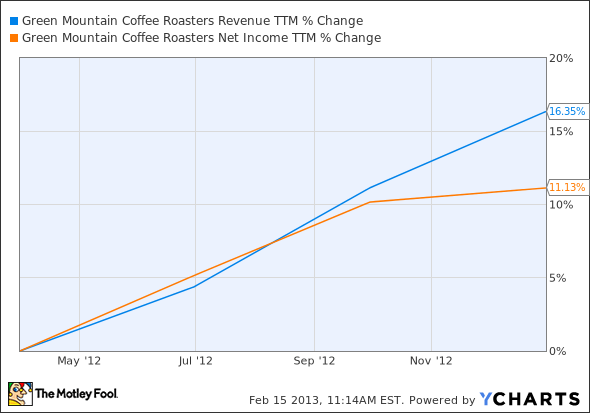 Analysts Debate: Is It Time to Dump Green Mountain Coffee Roasters? In that spirit, we three Fools have banded together to find the market's best and worst stocks, which we'll rate on The Motley Fool's CAPS system as outperformers or underperformers. We'll be accountable for every pick based on the sum of our knowledge and the balance of our decisions. Today, we'll be discussing Green Mountain Coffee Roasters , the single-serve coffee company, which we currently have an outperform call on. When we made our outperform call on Green Mountain Coffee Roasters in July, the stock had been beaten up by short-seller David Einhorn, giving us a great buying opportunity. The forward P/E ratio was just 5.1 and price/book was 1.3, levels you don't usually see in growing companies. We all saw it as an opportunity to buy on the idea that the market had overshot too far. But we all agreed that the leash on Green Mountain would be short. Today, we're sitting on a 150% gain and a CAPScall that has outperformed the market by 138 points. But the stock isn't nearly as attractive as it was seven months ago. My concern today is that the company doesn't have nearly as much upside going forward as Starbucks in the home brewing space. This holiday season there were K-Cups everywhere but they were always heavily discounted. Sales growth is great, but when you're doing it at discounted prices I have red flags popping up in my head. Margins didn't take a huge hit because of discounting, but that's in part because coffee costs fell in the fourth quarter. Don't get me wrong, I don't hate the stock here. Sixteen percent sales growth in the fourth quarter and a 21% increase in non-GAAP net income are positive, and paying 19 times trailing earnings isn't a bad price. If this were a cash portfolio I would probably cut my position in half and take more than my initial investment out and let the rest ride. But on CAPS we have to make a call one way or the other. Considering our huge win in GMCR, I think we should cash in our chips and lock in a great gain. The stock may continue to go up, but if it falls after a bad quarter or two I would hate to lose a 135-point gain right now. GMCR Revenue TTM data by YCharts. So, just to recap: Before our call, growth was like a hockey stick. After our call, growth was more like a pleasant ride up a small, flattish hill. Green Mountain's latest estimates for the rest of its 2013 fiscal year, which project between 15% and 20% growth in revenue and between $100 million to $150 million in free cash flow, are rather disappointing in light of its recent results and the $300 million in free cash flow booked over the past four quarters. The company's annual earnings estimate goes up to $2.82 per share, which is a big upgrade from its last guidance and also represents a solid 18% upside from 2012's adjusted earnings per share of $2.40. Making this harder is the fact that, despite the huge valuation-driven rebound, Green Mountain is still less expensive than its peers. Starbucks has that perpetual 30 P/E. Dunkin' hasn't dropped below 40 for a year. SodaStream , which makes a comparable at-home product for soda fans, sits at a P/E 33% higher than Green Mountain's -- although given its far more ambitious guidance, that's not too surprising. Heck, even J.M. Smucker , which makes Folgers, is valued more highly than Green Mountain despite the fact that analysts expect less growth from it than they do from Green Mountain. GMCR P/E Ratio TTM data by YCharts. This is emphatically not an expensive stock, even after more than doubling in little over six months. A respectable growth rate, reasonable valuation, and a positive (albeit lower) cash flow from a historically cash-flow-negative company all seem like good reasons to hold on for the time being. We almost certainly won't see another double, but this stock should still outperform the index for a while. Another earnings report down and all the more reason to believe that Green Mountain is back on track. The company's first-quarter report, while received poorly by investors, gave me every indication that Green Mountain's management understands what it's going to take to keep your friends close and your enemies closer. Heading into this report, which encompasses those all-important Christmas months for retailers, I'd been concerned with the impact Starbucks' new single-serve brewing machine, the Verismo, would have on the Keurig brewer, as well as whether or not Green Mountain would finally get its inventory levels under control. Needless to say, I wasn't disappointed on either end. A slight drop in gross margin for its Keurig brewing system due to rebates might set off the "warning" alarm for some investors, but I see it a bit differently. If Green Mountain can continue to undercut the Verismo in price -- which it really should have no problem doing since the individual serving pods for the Verismo cost $1, while K-Cups are priced about 30% cheaper -- then the rebates are well worth it in the long run. It's also worthwhile for Green Mountain to roll out rebates now when coffee prices are at multiyear lows -- it's some of the cheapest loyalty points money can buy! More important, lo and behold I almost fell out of my chair when I noticed that inventory levels fell! Dare I say that management isn't just aimlessly buying coffee at a willy-nilly rate and assuming it'll sell? In years past it did sell, but with purchases coming without regard for market conditions, it often constrained margins. I feel confident that Green Mountain's new CEO, Brian Kelley, who came over from Coca-Cola's North American refreshments division and has a better understanding of its core customer, has the company on the right track. At just nearly 14 times forward earnings Green Mountain isn't the value it once was; however, with a growth rate perfectly pacing its P/E (for a PEG ratio of 1), I feel it still has room to head higher. Globally, consumers have shown that they'll pay up for two things at the moment: branded coffee and healthier food options. With Green Mountain wholly focused on coffee while coffee houses like Dunkin' Brands and Starbucks worry about other aspects of their business, I can only see things getting even better. I vote to keep this pick percolating in the TMFYoungGuns portfolio. We agree that Green Mountain Coffee isn't the screaming buy it once was, but Sean and Alex overrule my vote (Travis here) to cash in the stock now. We'll keep an eye on growth, margins, and inventory levels to see if financial conditions continue to improve or whether consumers are changing preference. If something changes, we'll be back to debate again. For another look at Green Mountain, check out The Motley Fool's new premium research report. In it you'll find everything you need to know about Green Mountain, including whether it's a buy at today's prices, and you'll receive updates when conditions change. Click here for instant access. 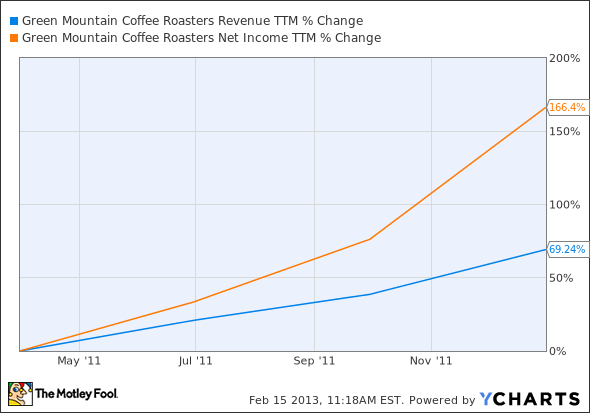 The article Analysts Debate: Is It Time to Dump Green Mountain Coffee Roasters? originally appeared on Fool.com. Fool contributor Alex Planes has no position in any stocks mentioned. Fool contributor Sean Williams has no position in any stocks mentioned. Fool contributor Travis Hoium has no position in any stocks mentioned. You can follow Travis on Twitter at @FlushDrawFool, Sean at @TMFUltraLong, and Alex at @TMFBiggles. 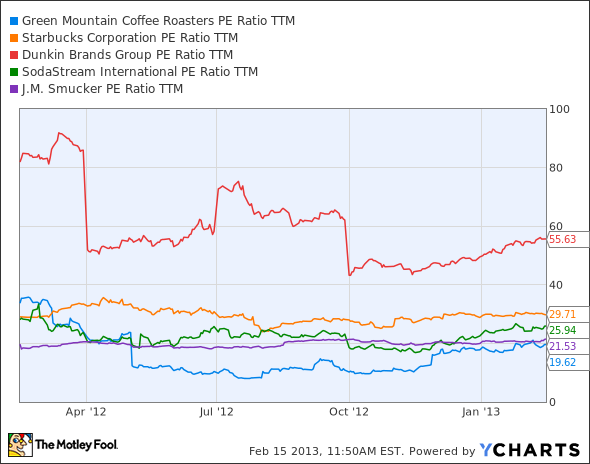 The Motley Fool recommends Coca-Cola, Green Mountain Coffee Roasters, SodaStream, and Starbucks. The Motley Fool owns shares of SodaStream and Starbucks. Try any of our Foolish newsletter services free for 30 days. We Fools may not all hold the same opinions, but we all believe that considering a diverse range of insights makes us better investors. The Motley Fool has a disclosure policy.